Do you love football, or do you hate it? When you encounter a question like that, it's really easy to see what the problem is. It's rooted in a fallacy that's fairly obvious even to those uninitiated in rudimentary logic; the false dichotomy, also known as the fallacy of the excluded middle. This fallacy is, as the name suggests, a fallacy of treating something as binary when, in fact, it isn't (which means it also constitutes a category error). Not all things are binary, of course, as this example readily demonstrates. There are propositions for which the answer may lie on a continuum as this one does or, indeed, for which there may be multiple answers that apply at the same time. Here, I want to explore some of that space, and how it can come into conflict with the way we think about some things. It will of necessity involve revisiting territory we've visited in previous posts, but I'll attempt to keep the repetition to a minimum. In my article Has Evolution Been Proven? I discussed some of the issues we've had coming up with a robust definition of 'species'. This is just one example of a broader principle. I'll mostly be using evolution to deal with this topic, but first a bit of groundwork about what I think is a source of some confusion for those who've had a cursory education in classical logic; the three laws. No, not Asimov's three laws, the three laws of classical logic. 1. No proposition can be both true and false simultaneously. 2. Nothing can be both what it is and not what it is. 3. For any proposition, either that proposition is true, or its negation is true. I covered some of this ground in my article, Deduction, Induction, Abduction and Fallacy, on how logic works and how it's applied in the sciences but, here, I want to focus on just one of the three classical laws of logic, namely the third one, the Law of the Excluded Middle. This seems fairly straightforward but, in a few recent conversations I've been engaged in, this law has been horribly misrepresented. Since I've wished to cover fuzzy logic, this seems a good springboard for doing so. P. The square of the hypotenuse of a right-angled triangle is equal to the sum of the squares of the other two sides. Pn. The square of the hypotenuse of a right-angled triangle is not equal to the sum of the squares of the other two sides. So, it's difficult to see what the problem might be, and one might struggle to see how this might be misrepresented in discussion. With a generous flourish of Hanlon's Razor, I choose the option that allows me to treat it as error and attempt to edify. But on the other hand there cannot be an intermediate between contradictories, but of one subject we must either affirm or deny any one predicate. Well, this is a pickle, isn't it? Here we have a right-angled triangle in which every side is the hypotenuse, because all the angles are 90°. Also, every side is the same length, so Pythagoras clearly doesn't apply. This example, from non-Euclidean geometry, counters the positive proposition. But what about its negation? 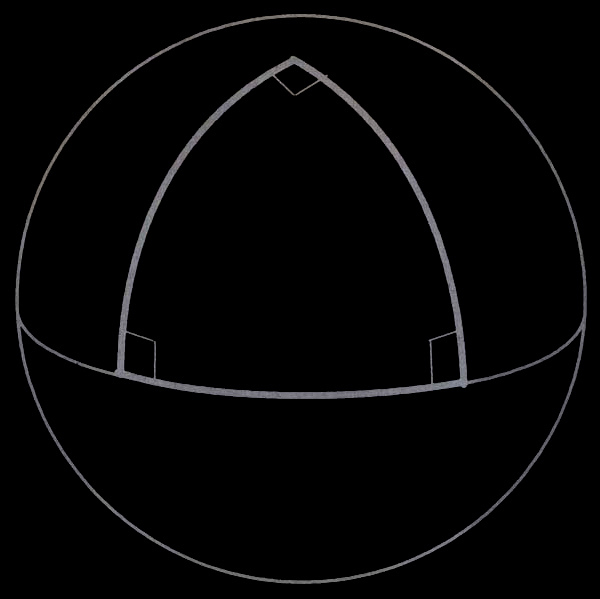 Clearly, right-angled triangles in Euclidean geometry are examples that support the positive proposition, which means that the negation is also necessarily untrue. Of course, there are ways to resolve this, such as to define the positive proposition in such a way as to only include Euclidean cases, but the real point here is that this proposition as it stands falls under the rubric of 'fuzzy logic'. So what is it? Fuzzy logic is a logic in which the truth values of variables can be any solution within a defined range, or even a set of solutions. As above, it applies to propositions that are not binary. As we can see, the example of Pythagoras' Theorem is just such a statement, because we can show examples of P being untrue, and we can show examples of Pn being untrue. These examples fall somewhere in between the two values. Pn. God does not exist. P1. I believe that god exists. P1n. I do not believe that god exists. P2. I believe that god exists. P2n. I believe that god does not exist. P3. I believe that god does not exist. P3n. I do not believe that god does not exist. Once again, we have a true dichotomy. However, this is a different belief than the ones expressed above. It would be contradictory to hold P1 and P3, as these constitute a true dichotomy. Only one of these positions can be held without contradiction. But what about their negations? These are not mutually exclusive, and it would be perfectly logical to hold both these positions simultaneously. One can have no active belief in the existence or not of a deity. There's nothing remotely contradictory about it. This is the abuse in a nutshell. It commits a category error, in treating the epistemological statement as having the same characteristics as the corollary ontological statement. It also commits another fallacy, the fallacy of the excluded middle which, in straightforward terms, is simply treating something as binary when it isn't. So what about fuzzy logic in other areas? There's one particularly troublesome area that I touched on briefly in my previous post on evolution, linked at the top of the page. I call it 'the discreteness problem', and Richard Dawkins refers to it as 'the tyranny of the discontinuous mind'. It speaks to our penchant for classification, and for putting things in neat little boxes with pretty Dymo labels telling us what things are. It's closely related to one of those laws of classical logic mentioned above, the Law of Identity. In evolutionary theory, as with many other areas of science, we have a large system of classification of species. It began with Linnaean taxonomy, as previously discussed, but this has since been supplanted with a more robust system, largely because the old taxonomic system was becoming horribly unwieldy, with new hierarchical levels being added to account for the burgeoning of discoveries of species and subspecies. All of these problems stem from the fact that we were treating a continuum as being discrete. The simple fact is that nature is under no obligation to fulfil our need to classify things, and is rarely compliant in this regard. Creationists will often argue their case on the basis of discrete designations, overlooking the fact that these designations are a matter of convenience only, and do not reflect the continuous nature of evolution. It probably doesn't help much that they seem to think entirely in terms of individual animals, which is a terrible mistake, because evolution is a population phenomenon. We can make this explicitly population-centred by the simple expedient of stating that each pixel represents an individual, and that the population progresses horizontally through time. There are no 'first' anythings, because every single organism is the same species as its parents, with no exceptions. 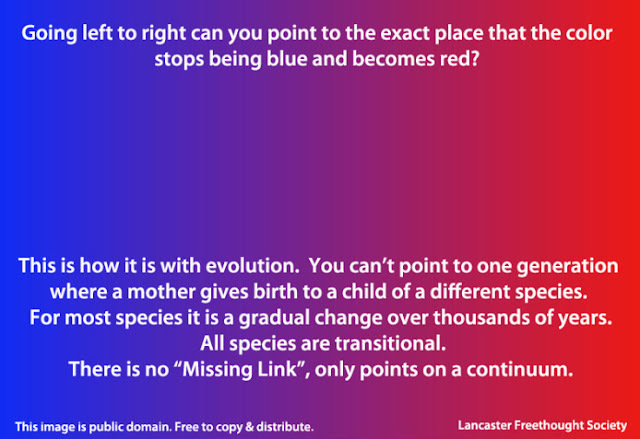 No organism gives birth to a brand new species and, indeed, such an occurrence would falsify evolutionary theory in its entirety. What we do see is populations accumulating tiny incremental changes in the genome that, over many generations, will result in cessation of genetic compatibility with ancestor strains. If we'd been tracking this population through all the changes, we'd still be calling them the same species as we were calling them at the beginning, but they wouldn't actually be the same species. When we don't track them continuously, but we find examples from the ancestor populations in the fossil record, we correctly classify them as separate species, and we put them in their little boxes and reach for the Dymo gun, confident in our classification. If this was a divergence in a single population, we'd be referring to the two populations as the same species, but which would take the specific name once the populations diverge beyond compatibility? I discussed this at some length in the linked article on evolution. It's a lengthy read but, if you haven't read it, I recommend it. It's among the most concise and complete treatments of evolution in a single place that I've seen. The take-home point here is that the world isn't digital, and will rarely, if ever, accede to our need for classifying. Our classifications are for our convenience only. Feel free to share. Comments, nits, crits and questions always welcome. * See my article on Morality and the False Dichotomy for more on this.